When you use a compile-time typed language, like Java, you expect that types in each variable will help you by restricting the possibilities for a value. Instead of being able to do everything, you want to do things that are valid in your domain. Discussions aside about strong vs weak typing, when you code with types you think of types as sets. A variable can be one of the elements of the implicit set for its type. Thus Integer a means that variable 'a' will be one of the elements in the Integer set, and only that. The compiler does an implicit up-casting and you expect that to be a valid operation. The set of Object instances is a super-set of String instances. That is basically because Object is a superclass of String and inheritance implies set inclusion. 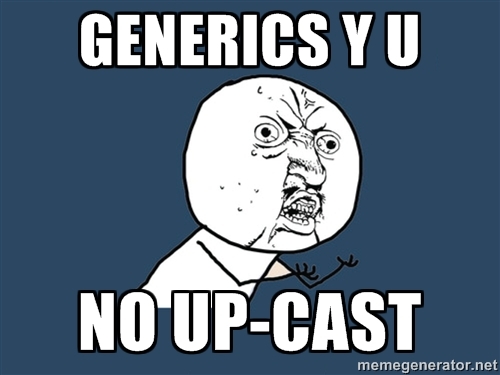 But once you upcast, you lose specificity. Your set of possibilities gets bigger and you can't ensure that 'b' will always be a String. The value of variable 'b' could be the String a, or could be something completely different like the number 1, that belongs to the Integer set. So far, I haven't told you anything new. If List<Object> is the set of all lists that have objects inside, then List should be a subset, right? We are just using intuition, but the compiler complains about it. Why can arrays be assigned and lists cant't? Have you ever dedicated some thoughts to it? They are both container types, they have both just one element type. What makes those types conceptually different? Reading the authors of generics you can find a very good reason for it. Remember, at that time, they were trying to generify collections (having only java 1.4 on their hands). objectList.add(1); // Hey, 1 is not a String! Since it's an object list, why can't you just put a number inside. It's an object right? And what happens when the reference to that same list instance but with a List<String> type tries to get the added element? Wait, what? Why do I have a cast exception if I'm not even casting? You are not only casting, you are down-casting (which it's not runtime-safe). The return type of get() method, in runtime, is Object, not String. That's why, in runtime, you need to downcast to String. The compiler does it for you, but at the cost of assuming that the list only contains Strings. 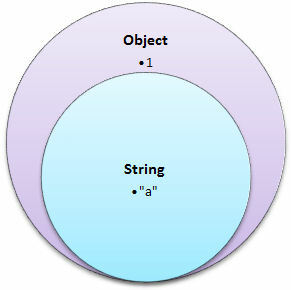 That assumption can be made at compile time if you avoid addition of other non String objects. How do they do that? At compile time, let's not allow the list to be used for anything else than Strings. So list of objects is out of the question. There are, of course, other solutions to this problem (see Covariance and Contravariance ) but we will stick to Java solution in this article. The only way to escape this rule, at compile time, is to move to the super-set, and then go down to the other sub-set. Fool the compiler by up-casting to List so it doesn't know which kind of elements is in the list, and then down-cast to List<Object> which is accepted. 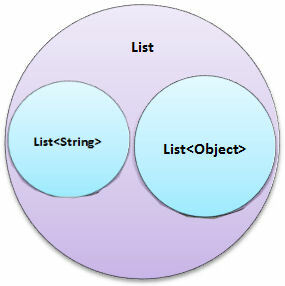 Why is that allowed and (List<Object>)stringList isn't, it's out of my grasp. Just to warn you: if you manage to do this, you may have ClassClassExceptions in runtime. On the next part of this article, I'll show you why this doesn't happen with arrays, and the implications for reflection.